There were testimonies of sightings of Andrews after that moment. It appears that Andrews stayed in the smoking room for some time, then continued assisting with the evacuation. At around 2:00 a.m., he was seen back on the boat deck. The crowd had begun to stir, but there were still women reluctant to leave the ship. To be heard and to draw attention to himself, Andrews waved his arms and announced to them in a loud voice. Another reported sighting was of Andrews frantically throwing deck chairs into the ocean for passengers to cling to in the water, though he may have been mistaken for chief baker Charles Joughin, who survived the sinking and reported doing the same thing. He then headed towards the bridge, perhaps in search of Captain Smith. Andrews was last seen leaving the ship in its final moments; the Northern Irish historian Gareth Russell argued that he was most likely swept overboard when the Titanic's bridge made a sudden dip into the ocean water at about 2:10 a.m.  His body was never recovered. ^ Gareth Russell, The Darksome Bounds of a Failing World: The Sinking of the Titanic and the End of the Edwardian Era (London: Harper Collins, 2019), pp. 257-258. 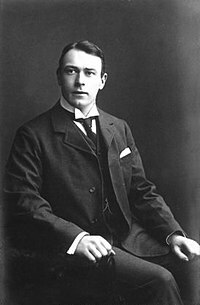 Wikimedia Commons has media related to Thomas Andrews. 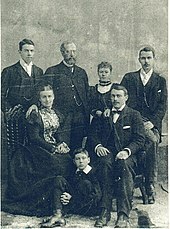 This page was last edited on 25 April 2019, at 19:37 (UTC).